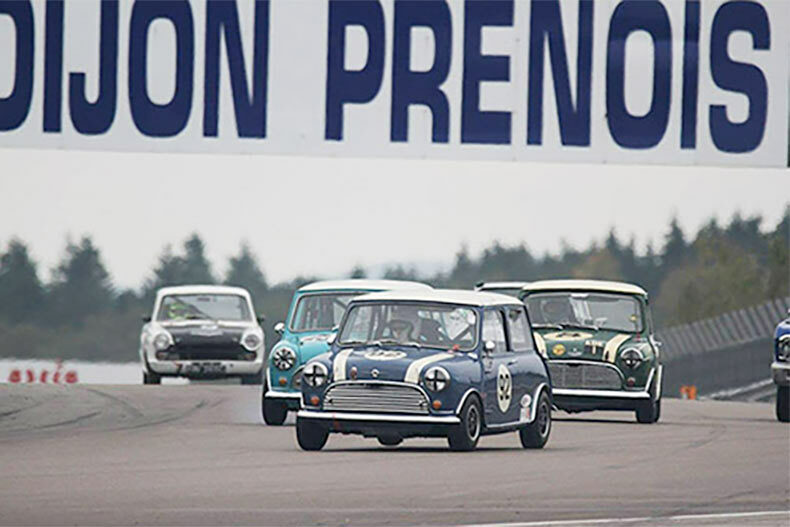 The Masters pre-66 Touring Cars in Dijon featured the Swiftune Mini’s of Steve Jones, Andrea Stortoni, Jonathan Lewis and Adrian Barwick, battling for the last final points before the championship winners were announced. It was a close qualifying session with the top 3 cars of Lewis, Jones and Barwick covered by just a second for 5th position overall and first in class. When it came to the hour long race, Jonathan Lewis made an incredible start and spent the race battling with the leading Mustang of Enrico Spaggiari. Lewis finished in an amazing 2nd overall in the Touring Cars beating Falcons and Cortina’s. Steve Jones finished 6th overall and the second placed Mini followed by Stortoni in 3rd.